We apologise for posting this just now, but the SSL Board has been quite busy the past year and we have been updating our members and friends mostly through our Facebook page (and members-only FB group). However, it’s better late than never! Integrationsdag 2015 was held on April 12, 2015 in Fäladsgården sal in Lund. It was our biggest and most ambitious event for the year, a whole-day affair which served as the culmination event for our Swedish-Filipino Integration Project. We had a variety of activities during Integrationsdag that catered to a wide audience, including the Integration Debate Challenge 2015 (together with the Lund Debate Society), several sessions of Filipino and Swedish food demonstrations, language and art activities for children, a whole-day film viewing featuring Filipino/Filipino-inspired films, a whole-day art exhibit by Rachelle Åstrand, a Filipina artist now based in Sweden, and a presentation by Johnny Åstrand (from Lund University) on his research on urban shelters in Metro Manila. Of course, Filipino and Swedish food was served for lunch and fika. The event was a huge success and it is what we consider as the highlight of SSL’s 2015. We were pleasantly surprised at the big turnout, and we were glad to notice that many of our guests were truly interested in the cultural activities. 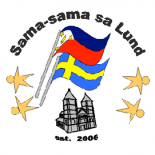 We would like to thank Lunds Kommun for making this event possible, and of course to all the guests who came, watched, and participated in the different activities of the day. Maraming salamat! Tack så mycket! This entry was posted on January 31, 2016 by Sama-sama Sa Lund in Uncategorized.